Its brightness flowing, filling the western courtyard. I faithfully follow the flow. With thoughts of leaving together with the parting cranes. Keep walking! Return to the old hills. Stretching out to the clouds, joining a secret rendezvous. Modern commentary on Qiu Xiao Bu Yue tends to attribute it to the 6th century scholar-official Liu Shilong (442 - 491).6 However, the source of this attribution is not clear; the text here quotes a Guangle Ji story about Liu Shilong and a melody on this theme, but does not specifically say he created such a melody.7 The title is also mentioned the Zhanran Jushi Wenji of Yelü Chucai, but that work does not seem to mention Liu Shilong.8 In addition, there has been speculation that the melody called simply Walking on the Moon (Bu Yue), generally connected during the Song dynasty to the famous qin player Guo Chuwang, in fact had a melodic connection to Qiu Xiao Bu Yue (see, for example, Rao, Chapter 5). In the absence of any tablature for a melody called Bu Yue this also remains pure speculation, but that should not diminish the shared feelings of the poem above. Any connection between the present (set of) melodies and Liu Shilong must also be considered a matter of speculation. 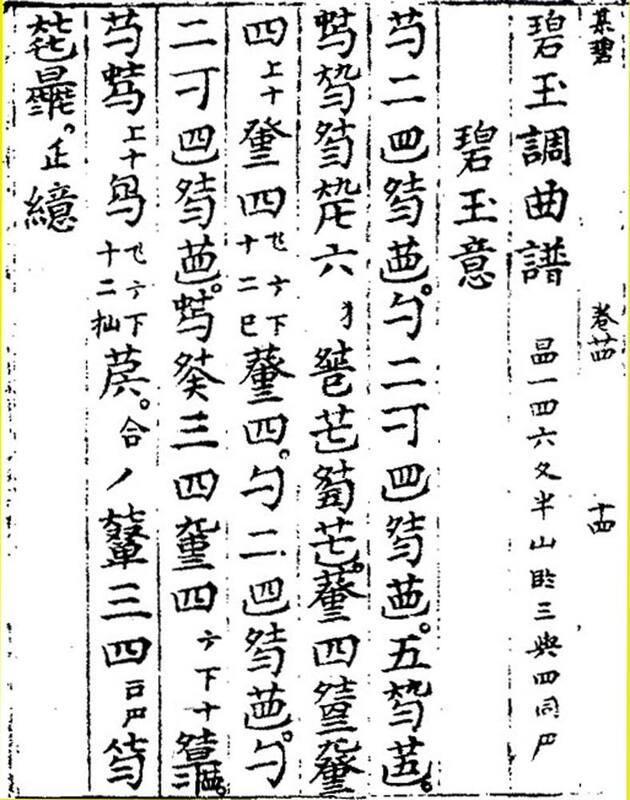 The only surviving version of a Qiu Xiao Bu Yue is the one here in Xilutang Qintong (1525), and its own commentary is rather vague, suggesting that either Liu did play a melody similar to the one here and the name for it was added later, or that Liu played a melody of this name and this inspired someone later to create a new melody with this name. An actual date for the present melody thus remains unclear. The aforementioned attempts in the Song dynasty and later sources to connect it (or Bu Yue) with Liu Shilong may suggest there may have been a melody on this theme dating from th 5th century, and melodies do tend to develop over the years (or centuries). Nevertheless, it seems unlikely that the version published in the Ming dynasty has any melodic connection with any melodies played by Liu Shilong. This melody did not survive into the current repertoire, but it has also been reconstructed by several others, including Yao Bingyan and Chen Changlin. There are also a number of recordings on the internet, mostly following or modified from one of them. Guang Le Ji says, Liu Shilong of Qi was good at playing qin, amongst scholars the best. He did not prepare for worldly matters (? ), but had a demeanor that seemed transparent and profound. On moonlit evenings he often played this piece, wandering in the central courtyard, free and comfortable. Later people used this to name the piece. The translation is tentative, but it does not seem specifically to say Liu Shilong created the piece so much as inspired it. 00.00 The phrase straddling the third and fourth lines of the tablature have an obvious connection to the second phrase in Sections 4 and 7 of Qiu Xiao Bu Yue. 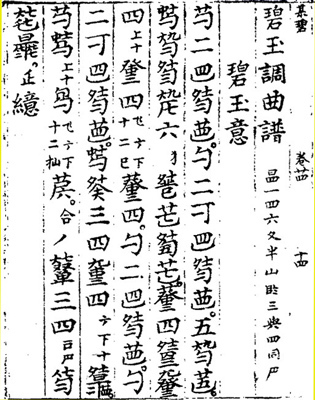 Shenpin Biyu Yi: 8/--/--; three occurences unrelated to 1525 but identical to each other, Shen Qi Mi Pu (1425), Fengxuan Xuanpin (1539) and Qinyuan Xinchuan Quanbian (1670). Biyu Yin: --/--/--; only in Sizhaitang Qinpu (1620); standard tuning and unrelated to here (not in Zha Guide). The tuning used here in 1525, which survives nowhere else, calls for lowering the 1st/4th/6th strings half a pitch each, then raising the 3rd string to be equal to the 4th string; this gives a relative tuning of 6 1 3 3 5 6 1. Another way to explain this would be first to set the strings according to guxian tuning (tighten 2nd/5th/7th strings a half step each: 6 1 2 3 5 6 1). Once you have done this, including the fine tuning, then you raise the 3rd string a whole tone so that it has the same pitch as the 4th string. It is significant to mention this method because if you try to use harmonics to fine tune biyu tuning as it is used here you can get the 1st, 3rd, 4th and 6th strings in tune with each other and the 2nd, 5th and 7th also in tune with each other, but you cannot align them all together. The biyu mode from 1425 actually gives as an alternate tuning a similar one to here: instead of "slacken third string" (the tuning actually used in 1425) it says you could "tighten the 3rd, 5th and 7th each one degree"; this most closely resembles guxian tuning (see mode chart) but instead of tightening the 3rd string you tighten the 2nd. The only known example of this alternative tuning is in 1618. As for the modal characteristics of the set of three pieces in 1525, overall their most significant tonal center is gong (1, do), but many phrases end on either yu (6, la) or jue (3, mi). This is somewhat comparable to the tonal structure of Shenpin Biyu Yi and Baji You. All three pieces in this mode make good use of the fact that the 3rd and 4th notes are tuned to the same pitch. Of note, however, is what seems to be a unique figure used in the tablature. It looks somewhat like a 三 (3) mixed with a 四 (4). At first it appears to be a misprint, and perhaps it is, but it might also be either a shorthand indication to play the two strings together, or it could be an indication that it does not matter which of the two strings you play. This shows how the music utilizes the fact that the third and fourth strings are tuned to the same note. Note also that the last line and the harmonic coda are almost but not quite the same as the last line and harmonic coda of Qiu Xiao Bu Yue. Zha Guide 23/--/-- says only here. Compare 25505.346 秋宵吟 (Qiu Xiao Yin). Elsewhere I have found no separate commentary for this piece. Its modal characteristics are described above. As mentioned with the melody itself, it has three sections, with the second section repeating quite closely the melody of the first section but in harmonics. Bringing out the connection required changing the punctuation of one phrase (from after the fifth cluster to after the sixth in the fourth line of the first section); it also led to adding punctuation dividing two other phrases. Zha Guide 23/197/-- lists it only here in 1525. An online search will give many examples of this attribution. At least one source quoted online, "醒心琴譜", is modern. Details of this source are unclear. Perhaps it refers to the 10th c. work 景祐廣樂記 Jǐngyòu Guǎnglèjì (八十一卷，翰林院侍講學士馮元等撰). This chapter as copied here has 24 references to "琴". Note also that "秋夜 Qiu Ye" is the prelude to the Qiu Xiao Bu Yue here in 1525. The above translation is tentative. Learning the melody as written is complicated by the tuning as well as the repetition of phrases with slight changes. The oddity of the tuning (with the 3rd and 4th strings tuned to the same note) means the finger positions are quite different from what one is used to. The repeated phrases with variations provide clues to what the original rhythm might have been; this is also a problem in that when I learn a piece I treat the tablature as though it was a teacher and try to play it exactly. Once this has been done the repetitions are no longer a problem, as it is not necessary to play them exactly as written each time.